Summary: While the news media fills the air with flotsam and jetsam, powerful forces reshape America. Chief among them is rising income inequality. Like so much happening to us, it results from rational policies skillfully executed by our rulers for their benefit, not ours. ID 84244231 © Prazis | Dreamstime. The evidence is more technical than usual here, so I state the conclusions at the beginning. Let us be clear about this. The drivers of inequality discussed here are political, although their effects are economic. First, business power is concentrating largely because the government does little trust-busting. Mergers which concentrate economic power receive only sporadic review from the government. Monopolies oligopolies grow like weeds. Second, the destruction of private sector unions was done with support of Congress and the Courts, as the Left abandoned them in favor of radical social engineering. None of this need matter for the future. We fought these battles once before, in the early 20th century – and won. We can do so again if we organize and stand together. “…Their study finds that the salary premium for union members compared to workers with comparable skills and demographic characteristics has remained relatively steady over the last 80 years despite large swings both in the overall number of union members and in their education levels. The less skilled the workers were, the greater the wage premium associated with their union membership. The researchers find a negative correlation between unionization rates and measures of inequality such as the Gini coefficient. “Between 1940 to 1970, when unionization peaked and income inequality narrowed, unions were drawing in the least-skilled workers. Before and after that period, unions were smaller and a higher fraction of their members were drawn from the ranks of high-skill workers. The 1940-1970 period also coincided with the highest share of union members drawn from minority groups. For more about the crushing of America’s unions, see these posts. Remember the union workers who bled to create America. Unions die. America runs out of fuel. “Stagnant wages and a declining share of labor income in GDP in recent decades have spawned a number of explanations. These include outsourcing, foreign competition, automation, and the decline of unions. What do we get instead of news about these obvious findings? Rising income inequality is one of the most powerful forces shaping America today, affecting all levels of society. Our news media seldom mention it. Instead we get stories about “skills shortages.” Few of these survive any serious scrutiny. Perhaps they convince some Americans that they are prosperous. Do we have a shortage of workers, or just cheap employers? Part one. Do we have a shortage of workers, or just cheap employers? Part two. The shortage of STEM workers: another bogus crisis crafted to benefit the 1%. The airlines’ crippling pilot shortage: another bogus “skills” crisis. More proof of rising inequality, perhaps our greatest threat. Review of Robert Reich’s great Inequality For All. edited by Rosemary Feurer and Chad Pearson. Previous Post America is well-run. Not by us. Not for us. The stats of robots by country male for interesting reading: “Robot density rises globally.” When America catches up it is going to put many people out of work and the lower wage earners are going to be the most hard hit which will push the have not’s further from the have’s. The saying goes, when the rich get richer the poor get babies. Indications are that the rise in the robot revolution is on the cusp of takeoff. The growth is exponential and the wage gap between the have’s and have not’s is going to increase at the same rate. My question is, Who are they going to sell the goods to? This revolution is not just confined to the manufacturing industry. Wait for it to hit the areas like transport and building. Framing for houses is coming on line and humans have now way of keeping up. It does not end there. the Lawyers , doctors and other professionals are going to find they are under pressure too. My son-in-law is a CA for one of the big 4; he tells me that they now have bots… they no longer need secretaries, receptionists, clerks doing the ticking but they are now cherry-picking CA’s. A bot installed in a large company not only does the audit at the end of the year, it does it in real-time. This bot does the admin too of taking phone queries, flagging unauthorized expenditure and oddities as well as answering emails. Now the CA’s man the bots and tune them. This too will be unnecessary as they are now introducing self learning bots. The fun is just beginning in the wage gap game. For a decade I’ve written posts describing how A new Industrial Revolution has begun (see the posts here, by subject). As usual, both the doomsters and utopians are delusional. That is a good example of the problems facing America: it’s not even difficult. Childishly simple compared to those we have faced in the past. The tech and methods of the new industrial revolution (of which automation is one) boost productivity. They make us richer. The gains are produced by machines – which we call “capital.” Under our current political economy, labor gets little of the gain — and those that lose their jobs get nothing. But that is just our tribal customs. The problem is identical to that of farmers in underdeveloped lands who refuse to use modern farming methods – because that’s not what their ancestors did. They have adapted, and so will we. 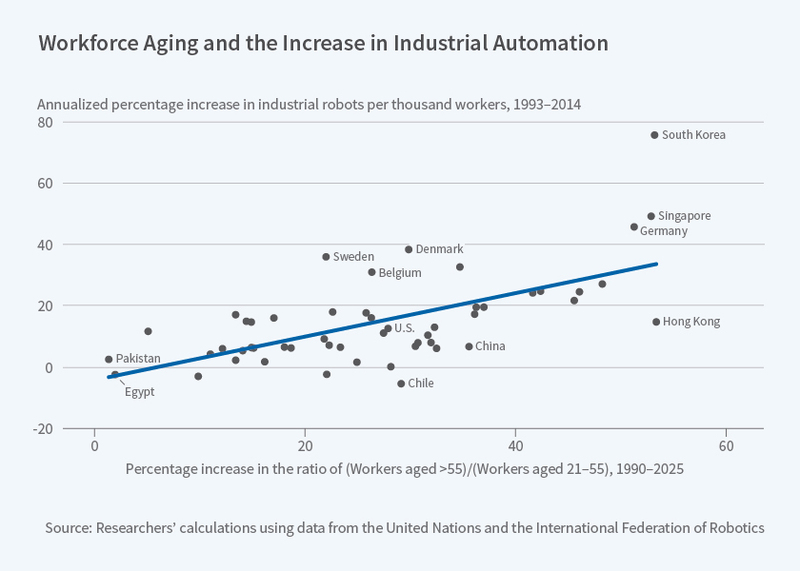 One big driver of automation is aging of populations. See Doomsters warned of End Times from overpopulation. Now *fewer* people are disastrous. In fact, an aging and education population might be ideal for the next age. See Japan: soon to become a 21st century star. For a more detailed look at this, see the July NBER Digest: “Automation Can Be a Response to an Aging Workforce.” The graph tells the tale. Click on it to enlarge. I see Larry Kummer has a left a reply that is depressing in its blindness to the reality coming. I CAN TELL YOU as one of those on the bottom that there is NO ‘adapting’ because there is no means of survival to “adapt” to. We are seeing NO sign that the benefits of folks like Adidas who can make a ton of shoes is translated to away for us to BUY these shoes…unless the society is gunna redistribute wealth…. Who are those secretaries, receptionists, and clerks gunna do when the bots replace them Mr, Kummer…? Unless you have a proven ability to predict events, I suggest you avoid such hard predictions. Always in motion is the future. Those bots don’t buy stuff. So automation can either reduce or boost national income, depending on how automation is done. The easy solution is higher taxes on capital (ie, owners of the bots). They were over 40% in the 1970s and the economy did just fine. The income can be redistributed in a wide number of means. It is not even a difficult problem compared to those we have surmounted in the past. Of course, past performance does not guarantee future performance. Falling union membership and power is a consequence of falling labor bargaining power. This always happens during great credit expansions. One consequence is that working class purchasing power falls and income inequality rises. Employment concentration is due to the same credit expansion. It produces speculation, an asset price bubble, financial engineering on a mega scale. This also makes inequality rise. Always has. These are consequences, effects, not causes. An account that treats them as causes misses the real problem, which is credit creation and debt creation. Read Austrian economics. Debt creation and driving lnterest rates to zero are the problem. Refuse to grasp those and you can’t understand the situation. Refuse to change them, and no amount of anti-trust or union sponsorship will help. What America needs to do is balance its budgets at home, allow interest rates to rise to normal levels, and stop bombing people abroad. None of that seems plausible, imo. Do you have any supporting evidence? The previous credit expansions in the US were accompanied by rising union membership and power: the late 19thc, the 1920s, and the post-WWII era (1950 – 1970). First, there is no such thing as “normal” interest rates. They fluctuate according to the supply and demand for capital, which is affected by many variables. Second, interest rates in the developed world are set by markets – and they are low in real terms, as they were in early 19thC Britain (Britain’s perpetual government bonds traded at 3% – 4%). And the Fed is not suppressing interest rates. The Fed has the ability to nudge the overnight riskless interest rate, depending on how much capital they’re willing to commit (i.e., buying or selling treasuries). But they have not been a major force since the end of quantitative easing in October 2014. That was the last huge credit bubble, the last one comparable to today’s. They only happen every 100 years or so in the same jurisdiction, because their end results are so catastrophic its a lesson it takes a couple of generations to forget. Dot.com was 1921. Or maybe 2007/8 was. Around now we are in 1929. On the other matters, including ‘natural level’ of interest rates, the Austrian economists and their business cycle theories. Big topic. False. That graph shows only two relevant data points. Union membership fell during the severe post-WWI recession years (esp the 1920-21 depression), during which large corporations crushed unions. It was flat at about 3.5 million during the 1923-1930 expansion (which included large-scale credit growth). See Historical Statistics of the US. False. Before the late 19th century the financial systems in Western nations were too primitive to create massive amounts of credit. The panics and busts of that era (e.g., the massive British Railroad bubble of the 1840s, the Long Depression beginning in 1873) occurred without much credit, with hard currencies, and before much use of fractional reserve banking — or other right-wing boogie men. Probably a few more like good wages and health care cost related something or other. I’ve come to believe there is no left nor right, only power. Society is complex. Life can’t be boiled down to such simplicities. That would be like driving with only one eye opened while wearing very dark glasses – at night. There is an ideological spectrum (Left-Right is a simple, handy one-dimensional picture of it). There is also power, and many other factors. I suspect most of these folks on this thread are in the top 20% and have never spend a month unemployed or have to use an EBT card…am I right ? The things Mandy lists are BIG items that resonate throughout the 90% who have been left to rot by the 1%. What crime did bank executive commit? Stupidity is not illegal. Nope. Many are young. Many are in the military. Many are retired boomers. Revolutions are rare. We remember the French Revolution because it was unusual. TV shows from the 1960s (e.g., Secret Agent, The Avengers, Man from UNCLE) often showed Africa’s leaders. Good or evil, they tended to be strong, smart, well educated. They gave us optimism about Africa’s future. Reality was less pleasant. While exploitive, the French and British turned over working governments to the locals when they left. What happen next was tragic. South Africa is the latest in this long sad story. Here’s not wanting to enter this discussion because I’ve nothing to add though It got me sopping up the info and chewing on it. However, I do want to express delight over the use of graphs and charts and visuals. Fabius Maximus makes good use of same throughout his many postings and I’ve a comment or two about that. Color me stupid, I just learned the term “Graphicacy.” Graphicacy is defined as the ability to understand and present information in the form of sketches, photographs, diagrams, maps, plans, charts, graphs and other non-textual, two-dimensional formats. See Wikipedia. I know that “The Buzzard’s Blog” may be a bit “off putting” to traditional journalists for its sometimes zany graphics. Point made here https://justice4all.blog/2018/08/15/big-tobacco-and-utahs-legislators/ The 54 Utah legislators who took money from Big Tobacco and who personally received this posting from me are still sweat’n, stomp’n and swear’n while a host of their constituents are have’n a great laugh. Hats off to Fabius for graphics/visuals that help this Ole’ Buzzard’s brain think faster and more clearly. I strongly recommend that anyone presenting information read Edward Tufte’s books. His first is the best place to start, and imo it’s his best: The Visual Display of Quantitative Information . Good lead! Liked what I saw. I’ll list Tuft with the visualization resources in my Criminal Justice Grad course, “The Institutional Memory of Major Cases and Visual Analytics.” Hans Rosling is another master of visualization found at Gapminder here https://www.gapminder.org/ Hans passed away but his art and legacy live on. His visualizations are extraordinarily unique, beautiful and insightful. Thanks for letting me get a bit off topic from time to time. Feel free to shut me up whenever you decide it’s time. I’m enjoying Fabius. I’m responding to, “10 thoughts on “America is well-run. Not by us. Not for us.” Your earlier reply seems to circle the point that I’m determined to make and that is for an appeal to engage more humor, simplicity, common and street sense in communications regardless the complexity and volatility of the issues. If it’s the primacy of the Rule of Law vs. Elites, tyrants, oligarchs, and scheming sycophants, I couldn’t agree more. The following paraphrasing is closer to my intent and seems to resonate with our time. May we be wise enough to advocate a return to our roots in order to resurrect the “Institutional Memories” of that which we’ve screwed and continue to screw. The challenge is to learn from the memories of our failures in order to recall, repeat, replicate and protect our many successes. We can fight back. I agree with most of what you said. Here’s the pointed end of the spear: we need to arouse the American people. That’s a common problem, confronted by Sam Adams and every generation or so of American reformers. More analysis is nice, but pouring more water on a rock won’t make it wetter. Talking about the wonderful spiritual qualities we need more of is imo pretty useless. My guess (guess) is that we’ve long passed the point at which that’s useful. Anger is probably our only remaining recourse. I’ve written 120 posts about Reforming America: steps to new politics. I long wondered why these didn’t arouse any enthusiasm among readers – unlike the food fight posts that got so much attention elsewhere. My guess is that the reason is obvious. People want food fights. Us good! Foes bad! Schoolyard insult, and you’re mother too! Talking to people locked into peon thinking about sacrificing their “lives, fortunes, and sacred honor” to gain self-government is … missing the point. We need to break Americans out of that thinking, back to what they were at their better moments. I don’t know how to do that. See my posts about ways to inspire, and about ways to arouse anger. They’re the best I’ve got at present. I’m setting out to digest much of your “Reforming America: steps to new politics” and the first stop is your “to arouse anger.” Fabius has worked his way into my political DNA and there doesn’t seem to be a cure. I love to play with words. Let me “metaphorialize” for a moment …. After 40 years, I lost my dear Sheri to Melanoma. The best that traditional medicine had to offer was cut, burn, and poison. As we continue to learn and in the future, I’m certain there will be more humane and effective ways of dealing with that dread disease. The tools that the Ole’ Buzzard has to use to reform our system are similar to cut, burn, and poison with humor, sarcasm, shaming and shunning at the pointy end of the spear. This is not a criticism but kind of a compliment by way of comparison … while Fabius is poking at and peering away over his petri dish … moving the DNA around scientificating for a solution … I’m compelled to piss em’ off by lighting their pants on fire. There’s room for all in this “dust up.” And … as you’ve endlessly and effectively pointed out … a mindful and responsible media could help at the nexus. Please forgive this Ole’ Buzzard’s foolishness. How much of income inequality is ill gotten gains do you think? Very little, imo. Our system allows the rich to harvest most of America’s productivity gains. Senior corporate execs pay themselves a large fraction of corporate profits. Estate taxes are easily avoided. Why steal? That’s why I support German model of Unions. They get to sit at the company board and know all the in’s and outs of the business. This way they get to milk the golden goose without inadvertently killing it. I am baffled by American conservatives confident belief that Europe is inferior to us in every way. So many of their political systems are obviously superior to ours.